Sustainable Development - Formosa Taffeta Co., Ltd.
To follow what the vice chairman announced in 2013 Sustainability Development Report for the economic, social and environmental policies. To create green processes and products through enabling FTC people to do themselves justice with environmental protection in mind, and to continuously grow and meet stakeholders’ expectations through the promotion of lean production, advances in effectiveness of resource usage, the utilization of environmentally friendly materials and green equipment, and the supply of ecologically safe products. (1). For FTC's long- and short-term business development, please refer to of the 2017 annual report\V. Operational Overview\(I) Business Status section\iv. Long- and Short-terms Plans (on pp. 111-114 of http://www.ftc.com.tw/doc/ftc_106_annual_report.pdf). (2). 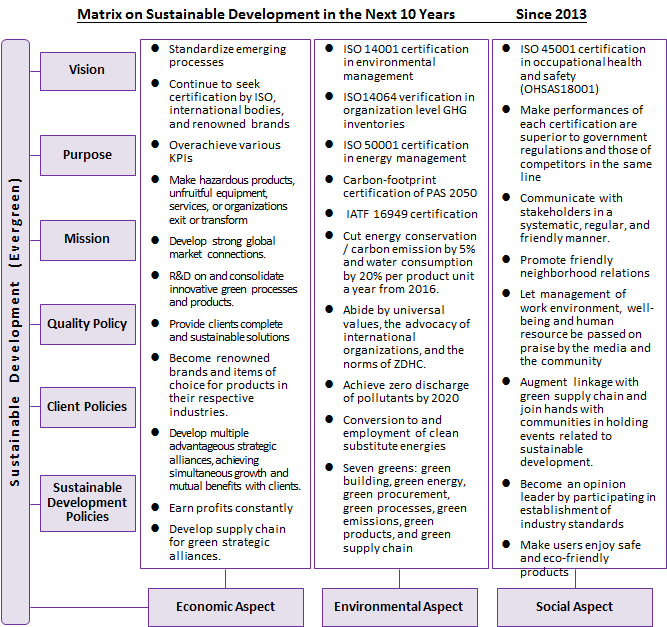 For achievable work items for execution in long-term business development plan, please refer to the following matrix on sustainable development in the next 10 years.